April 25, 2019 - 6:00 pm. We had a very good turnout for our joint campout with Caldwell and Kuna, there were 10 from TTT and close to 30 units total. Even though the wind tried to move us to Wyoming, I think everyone had a good time. A big THANK YOU to Ron and Bert for planning this outing. 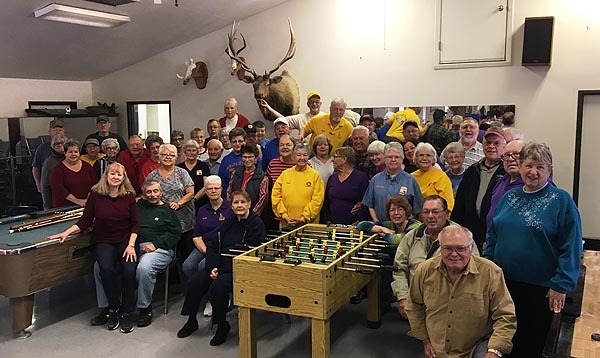 Hagerman has a very nice rec building that we used for get togethers to keep out of the weather. Bert arranged for each chapter to provide a meal so we only had to cook breakfast one morning. For those who didn't attend you might want to come next year, we will probably try to book Hagerman for April of next year. At the March meeting we found out that the campout at Baker City needed to be changed it seems that the campgrounds there were filled up last year for this July. Sherry is trying to set something up in Oakley for July, we can discuss it more at this months meeting. There may still be time to get reservations for some of the remaining campouts for this year, if any more of you are interested, just check the calendar. It's the time of year to start taking care of lawns and gardens, everything is beginning to look so green and nice. We have tomato and pepper plants started and our nectarine and plum trees are blooming. We got a fair amount of nectarines last year (it was the first fruit from it). We got the nectarine seedling 4 or 5 years ago at the farmers market at Emmett during the Southern Idaho Campout. That's about it for now hope to see you next Thursday, April 25, at the meeting. By the way we aren't sure if KOA is cooking for us this month at this point, more info will be sent by email.